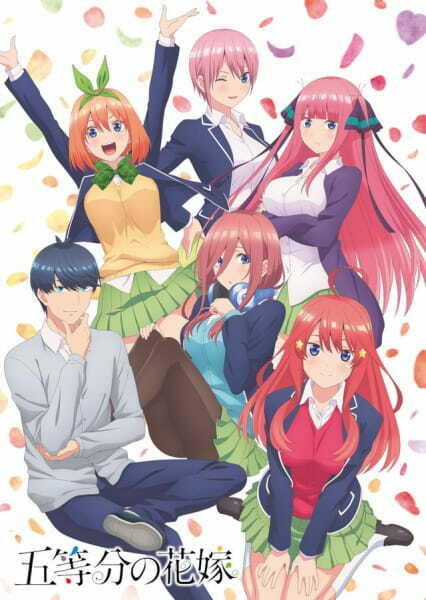 For those who are unfamiliar, Gotoubun no Hanayome follows Uesugi Futaro, a high school student who finds himself having to work part-time to help his family out of debt. He catches a break when a rich father organises Futaro to be his five daughters' after-school tutor; however, the quintuplets are more than Futaro bargained for! Suddenly finding himself surrounded by five beautiful girls who would rather do anything else but study, can Futaro make good on his employment and save the sisters' dismal academic journeys before it is too late? I found this show to be fairly enjoyable and the varying personalities of the sisters was nothing short of archetypal; however, it was great seeing how Futaro got to know each of them individually. Their individuality is a strong point of this show among other things like the comedy and animation in one of the latter episodes. This individuality is also expressed through the names of the five heroines of the show, Ichika, Nino, Miku, Yotsuba and Itsuki - so lets get into what makes these names particularly interesting. People who have a basic grasp of counting in Japanese could very possibly catch the running pun in the Nakano sisters' names. Their birth order runs in order as follows: Ichika, Nino, Miku Yotsuba and Itsuki, from eldest to youngest. Counting in Japanese has various rules and changes; however, Japanese words often make better sense if one is able to see how they're written. So, we have Ichika (一花), Nino (二乃), Miku (三玖), Yotsuba (四葉) and finally, Itsuki (五月). The sequence is quite literally 1, 2, 3, 4, 5 in birth order! This of course fits in with the series title, "Gotoubun no Hanayome", literally "Five Brides" in reference to how each of the sisters builds romantic rapport with the main character Futaro over time. Another interesting continuation of the numerical theme in the anime is the main character's name - Uesugi Futaro (上杉 風太郎). This is written with the characters for "above" (上), "cedar" (杉), which make up the family name, Uesugi. For the purposes of the connection we're going to draw, we'll leave out Futaro's first name. The image of cedar trees in high places created by the family name in connection to the Nakano family name (written "中野") creates quite the beautiful mental image. Nakano is written with the kanji "中", for "within" or "inside" and "野", which is "field". Together this gives us the idea of an "inner field". So when they're all together, Futaro and the Nakano quintuplets can be seen as "the high cedar tree in the inner field". Vivid.